Is there anything better than a big pot of bubbly soup on a Sunday afternoon? Yesterday, purchase I made some classic Spanish Comfort Food — Caldo Gallego. The name translates to Galician Stew, viagra sale and the soup originates from the Northern Spanish region of Galicia, which also happens to be where my great-grandparents were born and raised. This traditional white bean soup comes in many versions. With chorizo and without, with turnips and without, with bacon and without. My version uses slab bacon and a lot of smoked ham hock to create a smoky, salty ham stock. 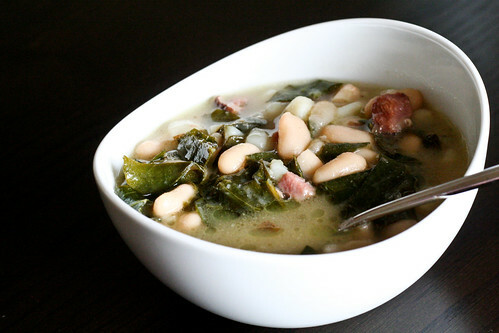 Add cannelini beans, potatoes, onions and lots of collard greens for soup full of flavor, texture and healthful goodness. Sop everything up with a fresh baguette and you’ve got comfort food at its best. Make sure to make a whole bunch because it tastes even better the next day. You can also freeze individual portions for easy portable lunches or emergency week night meals. Place your biggest pot over medium-high heat. Cook the bacon until the fat renders a bit, then add the ham hock and cover with the water. Bring to a simmering boil, cover and reduce heat to medium. Simmer for 1 hour. Remove the ham hock to a cutting board, but leave the pot on the heat. Discard the bones and any additional fat, then cut the ham into small, bite-sized pieces. Return the ham to the pot. Raise the heat to medium-high, then add the potatoes and onions. Bring to a slow boil for 20 minutes. Add the greens and beans to the pot and simmer for an additional 20 minutes. Serve and drizzling with good olive oil. Eat with a big piece of fresh baguette. This soup looks really outstanding. I always have my eye out for good greens recipes and I definitely think this would be a huge hit over here! LOVE your blog, by the way. You have such wonderful, creative recipes! I’m loving all of these ingredients – looks great! I am a BIG fan of your blog– your goat cheese tartlets are absolutely my new favorite appetizer! Keep the wonderful food and photos coming! Now, this may be off topic (the topic being soup), but I’m curious if you’ll be preparing Christmas dinner, and if you have a menu planned that you’d be willing to share. Fantastic soup for a winter day! My Mother-in-law makes a really good Christmas dinner of Beef Tenderloin, Twice Baked Potatoes, Green beans and salad. Other than that, I have no experience with traditional Christmas dinner! Mel- think you could sub in some smoky sausage for the hock? May I ask, where did you get the bowl? I love the shape! Thanks for the recipe. My favorite Caldo Gallego is at Versailles on 8th street. I never get down there much anymore. I’m hoping to be able to make my own just as good. PS… I love your site. We are a lot alike! It’s our wedding fine china and I absolutely love it. The plates are great too! I stumbled across this blog and recipe while searching google for a Caldo Gallego recipe and this is the best americanized version of the recipe I’ve found! I am from Madrid and have family in Galicia where I’ve spent time every year of my life so I am very familiar with this soup (one of my all-time favorites) and I want to send BIG THUMBS UP to Melissa for her write up! Spanish food might just be my favorite kind of cuisine! The result is a little lower carb and meatier. The chorizo, garlic and green pepper all make it taste a bit more like my grandmother used to make it. Hi, I love this photo. I’m editing a cook book and would love to have permission to use this photo. Is there a chance you could give us permission to use. You will receive attribution in the book. Just found your blog while searching for a recipe for traditional Caldo Gallego. My grandmother makes the most amazing one I’ve ever tasted, but she hasn’t given me the recipe yet, and I am having a huge craving for it. Even in the thick of this hot summer. Your recipe is the closest one I’ve found to my gram’s. And judging by the beautiful photo, I think I’ve hit the jackpot :)! I’m also in Miami, so very glad to have found you! For a real spanish caldo gallego, try “unto” instead of beacon (now available even in Publix) and turnips (no potatoes) and do add a spanish chorizo (Palacios) and make it soupy. The one at Versailles is not that good, try it at any of the smaller spanish restaurants now throughout Miami, or better yet in Galicia.